Micellar Oil-Infused Cleansing water, for dry and sensitive skin. Cleanses and nourishes the skin. Removes even waterproof make-up. Non-greasy, for face, eyes and lips. No Rinsing. 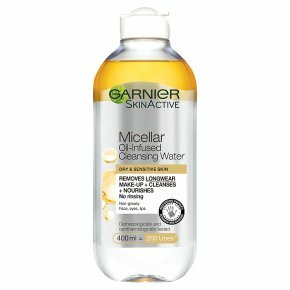 Is Garnier Micellar Oil-Infused Cleansing Water Right For Me? Yes, if you are looking for an efficient, yet gentle cleanser that removes all make-up (even waterproof), impurities and dirt and leaves skin feeling nourished. Suitable even for dry, sensitive skin. Why Is It Different? Micellar Oil-Infused Cleansing Water is an easy way to remove even waterproof make-up, and cleanse and nourish the feel of skin, in 1 step without rinsing. How Does It Work? For the 1st time Garnier Micellar technology is formulated with oils. The micelles (cleansing agents) capture impurities like a magnet & lift away dirt from the skin, whilst the oils instantly dissolve all types of make-up. The Results: Perfectly cleansed, nourished feeling skin without rubbing or rinsing.